Science Magazine devotes its entire February 9 issue (fee for download) to "Science and Technology for Sustainable Well-Being." The issue examines the need to move toward new sustainable sources of energy in the face of human-induced climate change, increasing worldwide energy demand, and dwindling supplies of fossil fuels. According to John P. Holdren, president of the American Association for the Advancement of Science, the magazine's publisher, "[n]othing is more important to the human condition in the 21st century than rising to this set of challenges." The website also features a free podcast on the issue. A Legally Enforceable Triple Bottom Line -- Nau! In a post last year, I advocated that companies put sustainability and triple bottom line language into their articles of incorporation and bylaws to make these commitments legally enforceable and more meaningful. I have been on the lookout for companies that have done so, but have been unsuccessful. Until Nau. sustainability and a triple bottom line in their articles of incorporation or bylaws. I have read that Nau has language to this effect in its bylaws. What is the language? Has this language helped or hindered Nau in raising capital?" Even before Nau had raised any money to fund its efforts or had designed a single product, the team began to examine how to set the company on a deliberate social and environmental trajectory. Corporate attorney Robert Hinkley influenced Nau's founders. Hinkley incorporated the work of management expert W. Edwards Deming and systems theorist Peter Senge to develop new ideas pertaining to the notion of a corporation as citizen. Deming had written that "most of the time it's the system that causes the problem, not the people in the system." He combined this idea with the insight of Senge, who said that to change any system you should "look to make the smallest change possible that will generate the biggest effect." From these theories, Hinkley created a code for corporate citizenship. In only 28 words, it stated that henceforth the "duty of directors shall be to make money for shareholders but not at the expense of the environment, human rights, public health and safety, dignity of employees, and the welfare of the community in which a company operates." Nau chose to follow Hinkley's guidance and include similar language in its corporate bylaws. This issue has come up in the process of raising capital to fund the company. In fact, people have advanced the point of view that the language suggested a greater degree of responsibility and therefore could lead to the company being devalued. We have taken the opposite point of view and have been able to resolve any objections that we have received to date. If you would like to see the exact language of Nau's Rules of Corporate Responsibility, please see the March/April '07 issue of GOOD magazine. Subscribe to GOOD magazine for a year and they will give 100 percent of your subscription fee to the nonprofit organization of your choice. This is an extremely bold move by Nau. As Brody notes, some have indicated that Nau might be less valuable because it is taking on a greater degree of responsibility. And indeed, in a very real sense, Nau has agreed to internalize the societal costs of things such as the emission of carbon dioxide, for example, that almost every other corporation is free to externalize with almost complete impunity. And we are all the better. By taking this step, Nau creates a more valuable world, and its efforts should be widely recognized and applauded. But we need to go futher. States should create a mechanism to encourage businesses to follow Nau's lead. New York, for example, could amend its Business Corporation Law to permit creation of a new corporate form, a "Sustainable Corporation." If the Sustainable Corporation includes statutory "sustainability" language in its charter documents requiring the business to comply with a set of specific environmental standards much higher than otherwise required (e.g., carbon neutral, commitments to waste reduction and recycling, green purchasing, etc. ), the business would be entitled to a very specific set of benefits (tax credits, expedited permitting, business assistance, etc.). The "sustainability" commitments could be enforceable not just by the shareholder, but by the state's Attorney General as well, similar to how Attorneys General currently have oversight authority over charitable corporations. 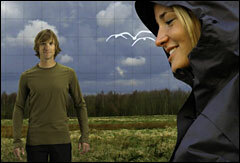 Businesses such as Nau increase the value of the commons, and we must help them succeed. Perhaps the most important proposal affecting sustainability currently before Congress has nothing to do with the environment -- at least not on its face. It’s the “net neutrality” law that was introduced last week that will assure that the Internet remains single-tiered, and is not divided into a fast lane and a slow lane (see story here). Any website today, no matter how big or how small, has equal access to web users. For years, however, cable and telephone companies, have advocated for a two-tiered Internet that will grant users high-speed access to companies who pay large fees. Users of start-ups’, non-profits’ and individuals’ websites who can’t afford the high fees will be relegated to second class. Although the battle is being portrayed as pitting supporters such as Google, Yahoo, and Amazon against carriers such as Verizon, AT&T and Comcast, it has critical consequences for all of us. Net neutrality is necessary to preserve the Internet’s role in promoting new businesses, free expression and the collaboration necessary to move us toward sustainablity. Net neutrality will help maintain the Internet as world-wide, bottom-up, communications vehicle. The Internet permits dissemination of critical information -- historically through email and websites, but more and more through powerful collaborative tools such as wikis. Best practices can be shared across the planet in areas such as energy efficiency, land use, and water management. Environmental Defense’s Scorecard site, for example, aggregates data and uses powerful Internet technologies to provide local information about pollution. Non-profits such as Ecological Internet provide information retrieval tools, portal services and analysis that aid in the conservation of climate, forest, ocean and water ecosystems. And critically important for our purposes, sites such as Treehugger would unlikely have become such large centers for environmental information if it had to pay hefty fees to get on the fast lane. The Internet is becoming ever-more important for sustainable commerce. Athough Ebay is not widely recognized as a “green company” its business model is based entirely upon the “Reuse” in “Reduce, Reuse and Recycle.” And new businesses emerge everyday that use Web 2.0 technologies to support sustainability principles. A two-tiered web will have the powerful affect of maintaining the status quo in communications in commerce at a time when we desparately need change. Maintaining net neutrality will help insure the vitality of perhaps the single most important tool we have to meet the challenges of the 21st Century. 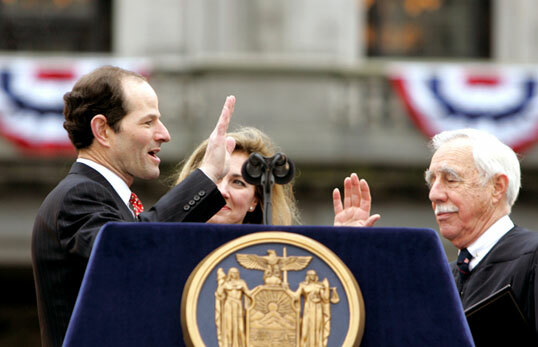 Those of us who care about sustainability have high hopes for New York's new Governor Eliot Spitzer. During the campaign, Spitzer said that his top priorities would be "environmental stewardship, expanding energy conservation and renewable energy sources, and reducing greenhouse gases (see his environmental promises here). Spitzer promised to close the two Indian Point nuclear plants and, my personal favorite, as Attorney General he earmarked funds in an acid rain litigation to install solar panels in municipal buildings in New York (see related post here). Given that sustainability and climate change are the paramount issues of our time, we need bold initiatives from the Governor and we need them fast. It's too bad that the new Governor did not mention the environment or energy at all in last week's Inaugural, and he didn't mention details in his State of the State address until the hour-long speech was nearly finished (page 17 of a 21 page text -- see full text here). Spitzer's State of the State did include some details about energy and the environment, and in ordinary times, his words would be encouraging. But -- as evidenced by this winter when daytime temperatures in New York have mostly been in the fifties -- these are not ordinary times, and Spitzer's first statements as Governor were, frankly, disappointing. Although Spitzer said that "we must implement an aggressive [energy] conservation strategy," his focus was "first and foremost to reduce the state’s own energy consumption," as opposed to reducing private electricity use within the state. Also, the cited reason for conservation was to reduce energy costs, an important reason, but was not rhetorically tied to reducing greenhouse gas emissions -- a point that should have been made for educational and symbolic purposes at least. Spitzer said that "[w]e must also add substantial clean generation capacity by passing a new Article X power plant siting law [and] encourage the [Public Service Commission] to effectuate the long-term contracts needed to build new power plants and re-power the old ones." While these efforts are clearly needed, they will most likely facilitate construction of natural gas plants, and wont do anything to create a market for distributed and emission-free energy sources such as solar. Also, while it's good that the Governor stated that "Lieutenant Governor Paterson will lead efforts to increase renewable energy production so the state can meet its goal of obtaining 25 percent of its energy needs from renewable sources," Spitzer must be more ambitious. While the 25 percent goal required by NY's Renewable Portfolio Standard sounds good, it's actually paltry given that New York already receives 17 percent of its electricity from the "renewable" hydroelectric, primarily Niagara Falls (see sources of New York's electricity here). Possibly more encouraging, Spitzer said that "New York should also build on its existing regional compact to address climate change," and that he has "already started speaking with other governors about the need to link and expand our climate change initiatives. This is something that can and must be achieved..." Hopefully these discussions will turn quickly to action. Although I'm still optimistic, I was hoping he would take advantage of the Inaugural or the State of the State address to announce a bold new sustainability and renewable energy initiative akin to Gov Schwarzenegger's One Million Solar Roof project in California. In fairness, Schwarzenegger didn't unveil his plan until August 2004, when he had been in office nearly a year. But while there's still time for Spitzer, is there time for us? It's January. Cherry trees are budding from Washington to Boston. Bears are not hibernating in Europe. This year, 2007, will likely be the warmest year yet. Hey, it's Albany in January!! How come Eliot's not wearing a coat? Municipalities can build green roofs on city structures and create incentives for private building owners and developers to use them. Green roofs typically have a layer of soil with plants; their greatest advantage is water management, since they can absorb 50-60% of the rainwater that falls on them. This means that storm water enters the municipality's drainage system in a slow, controlled flow, rather than the typical high-volume surge from impervious surfaces that frequently cause storm water overflows to mix with sewage. Green roofs also help buildings stay cool in the summer and retain heat in the winter. Portland, Chicago and Toronto all have green roof programs. Similarly, porous pavement can reduce storm water flooding and pollution by permitting water to pass directly through concrete or asphalt into the soil rather than sheeting off. Philadelphia recently announced it intends to use porous pavement in its storm water management program. For general information on green roofs, see www.greenroofs.com.